The Green Deal is a nationwide government initiative designed to encourage a more sustainable way of living. Our headline to the Green Deal campaign was to introduce Ecoisland as the doorway to the Green Deal on the Isle of Wight. We wanted to create an image that would suggest a lovely warm home and give a welcoming appeal. It was on a cold winters night whilst walking home through Cowes and seeing the light shining through front doors, giving off that lovely warm. welcoming glow, that gave us the idea of the door with stained glass. 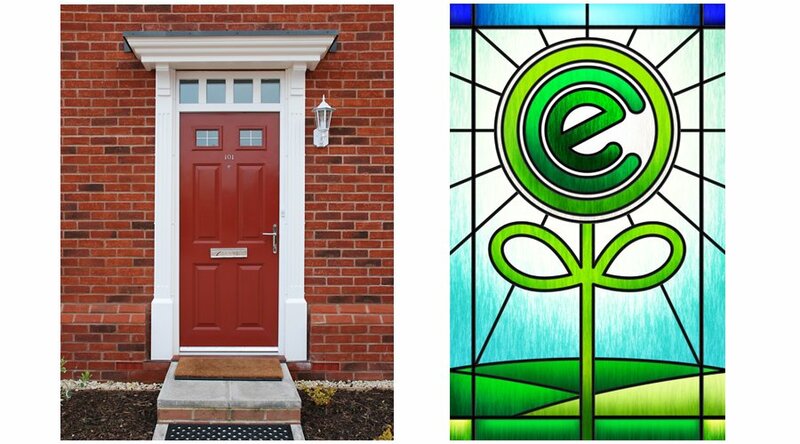 The flower graphic was a perfect icon for Ecoisland and would work great given a stained glass treatment. This image was then applied across all of the marketing and advertising for the campaign. The original door image came from a stock image library. The stained glass flower image was drawn up in Illustrator first of all and then given a nice glowy stained glass feel in Photoshop. These elements acted as the base canvas to the composition.